Look at all that candy! It's everywhere - and so are a bunch of crazy little Peeps! Are they trying to give kids cavities?! I kid, I kid. 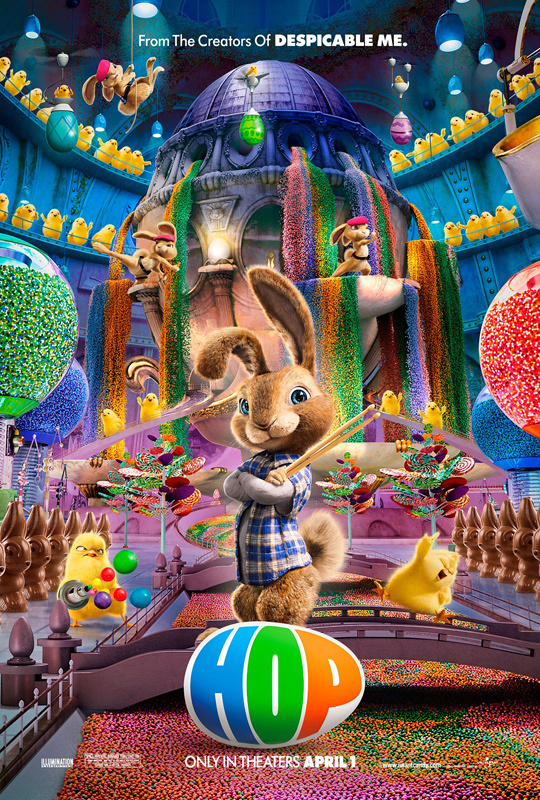 Apple (via IMPAwards) just added this final poster for Illumination Entertainment's new comedy Hop, starring a live-action James Marsden and CGI Russell Brand - as the Easter Bunny. We finally saw the official trailer for this, and actually got a look at the storyline, just a few weeks back, but I'm honestly not that excited. And I don't know if a poster full of more candy than Willy Wonka's Chocolate Room is going to get me in theaters, but it's definitely going to cause kids all over to flip out over it. Enjoy! "As Fred struggles with the world's worst houseguest, both will learn what it takes to finally grow up." If you haven't seen the trailer - watch it here. Directing Hop is Tim Hill (Muppets from Space, Garfield: A Tail of Two Kitties, Alvin and the Chipmunks) from a screenplay by Cinco Paul and Ken Daurio (Despicable Me) as well as Brian Lynch (Big Helium Dog, on Twitter as @BrianLynch). This is the first live-action film from Illumination Entertainment, responsible for last year's animated Despicable Me, but as you can tell, this has multiple animated characters anyway. Hop lands in theaters everywhere starting on April 1st next month. showed the trailer to the kids....we now will be attending! Wow, I really hated the early stuff, but this looks great actually.